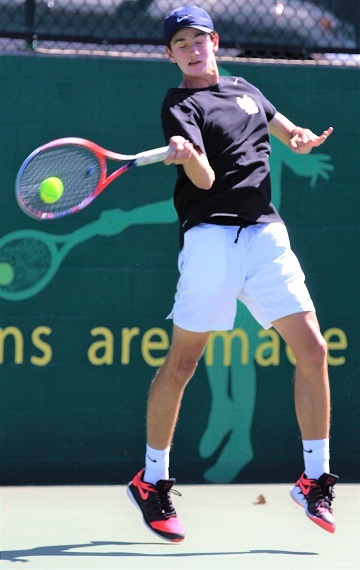 Mira Costa’s boys tennis team has fought through inclement weather and faced formidable opponents while earning a 12-0 record, but the next week will undoubtedly prove the merit of the team. Mira Costa entered the week ranked No. 4 in the CIF-Southern Section Division 1 poll, just behind No. 3 Peninsula who the Mustangs defeated 11-7 Tuesday afternoon. In singles, Matthew Poh won three sets 6-2, 6-2, and 6-3; and Tim Dzhurinskiy won three sets 6-2, 6-3, and 6-2 for the Mustangs. In doubles, Max Wuelfing/Ethan Han won two sets 6-4 and 6-1; and Nick Darrow/Kyle Sillman won three sets 6-3, 6-4, and 6-4. Weather permitting, Mira Costa travels to take on No. 2 Harvard-Westlake on Wednesday and will host Santa Monica Thursday at 3 p.m.
Next week, the Mustangs are scheduled to play No. 7 Northwood on Monday, Westlake on Wednesday and rival Redondo on Thursday. Mira Costa is led by seniors Poh and Sillman, junior Dzhurinskiy, and freshman Wuelfing. Also contributing are seniors Han, Nick Darrow, and Noah Gonalons, along with freshmen Tanner Chen and Kelly Giese. Mira Costa defeated Palos Verdes last Thursday in games 9 (77 games) to 9 (71 games) but Palos Verdes played without its best player, Kai Brady, who won’t be eligible until Mar. 25 when his Sit Out Period expires as a result of his transfer from Redondo to Palos Verdes. Mira Costa is coming off victories over Chadwick and Beverly Hills. Poh and Wuelfing swept their singles matches and Chen and Han won three doubles matches against Beverly Hills. While Palos Verdes and Peninsula each recorded 3-1 records at the Golden State Classic, the Mustangs scored 5-1 wins over Menlo-Atherton and Monta Vista before defeating Belarmine 4-2 and Canyon Crest 3-3 (27-22 in games won) to claim the title. Mira Costa returned to defeat host Arcadia (No. 6, Div. 1) winning in games 81-77. Dzhurinskiy swept three singles matches and Han and Wuefling were victorious in three doubles matches.